Amazing Grass was founded in 2002 by Todd Habermehl and Brandon Bert as a means of living a healthier lifestyle and cutting down on the caffeine addiction. 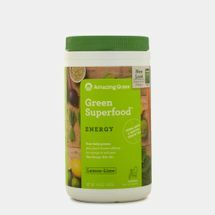 They began by mixing green drinks for their friends and co-workers and subsequently created Amazing Grass green superfoods using the highest quality organic, non-GMO fruits and vegetables. Rejecting factory-based farming in favour of sustainable practices such as organic food cultivation, their goal is to leave the earth better than when we found it. Amazing Grass green superfood powder is the perfect way to supplement your overall nutrition. Amazing Grass contains a variety of vitamins, minerals, plant based proteins and phyto-chemicals combined with leafy green superfoods that assist the body in maintaining healthy organ function, contribute towards nutritional detoxification and improve immunity. Amazing Grass greens have gone through strict quality control regimes and have been tested as USDA organic, non-GMO, kosher pareve, vegan and gluten free. These green superfoods can be mixed into anything - juices, smoothies, salads and even desserts, and can be used in conjunction with other nutritional supplements for you to reap the benefit of a healthier lifestyle. Choose from a wide range of green superfoods to suit your lifestyle. Stir Amazing Grass greens into juices or shakes, or toss a scoop into almost anything you love baking. When you've got a long day ahead of you, rely on Amazing Grass for the right solution to help you power through. Browse through the Amazing Grass green superfoods range of products on the Sun and Sand Sports website and shop online for home delivery across Dubai, Abu Dhabi and other emirates in the UAE.